Spoiler Warning: Top Gear's new reasonably priced celebrity lap car has been revealed. It’s safe to say that the BBC is probably quite embarrassed about the dismal reception and plummeting ratings of last year’s Top Gear season. Chris Evans was largely to blame, since he made changes to the format which just didn’t work. With the show making a comeback next month, it seems that any traces of Evans’ influence are being removed. The Sun reports that the Star in a Rallycross Car segment introduced last year has been scrapped for the new season, as has the Mini Cooper rallycross car itself. Its replacement may surprise you, however. The new Top Gear Reasonably Priced Car is…a Toyota GT86. "All trace of Chris is basically gone," a source told The Sun. "But bosses are hopeful Matt LeBlanc, Rory Reid and Chris Harris will do the business. 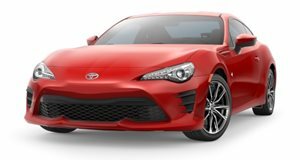 The GT86 is brilliant to drive but also risky." Adding a rear-wheel-drive car should make the celebrity laps more exciting and unpredictable – particularly in wet weather, since it rains a lot in England. But whether the GT86 can be classed as a “reasonably priced” car is open to interpretation. Starting at $26,000, it’s a significant step up from the modest Opel Astra used before Chris Evans introduced the Mini Rallycross car, but it’s still a relatively affordable sports car so it fits the bill. Whether the Star In a Reasonably Priced Car will revert back to the previous format remains to be seen, since the Rallycross replacement also featured two celebrities facing off each other which made it less focused. All we ask is that Top Gear’s celebrity sections are more entertaining than The Grand Tour’s 'Celebrity Brain Crash,' which turned into a painfully unfunny recurring joke in which celebrities were 'killed off' in every episode. Celebrities will now also be taught by Chris Harris as well as the Stig, so they’ll be in safe hands. Top Gear returns on March 5th in the UK and March 13th in America in what looks to be a promising new era for the show.